Captain Joseph A. Felt enlisted in the Naval Reserve in September 1947 and later was commissioned as an Ensign after graduating from Brown university in 1953. His first duty assignment was with Beach Master Unit TWO. This was followed by a tour at the THIRD Naval District Headquarters and subsequent assignment as First lieutenant and Weapons Officer on USS Salamonie (AO-26). Following a course of instruction at the CIC officer and Air Intercept Controller Schools in 1959-60 at Glynco, Georgia, Commander Felt reported to USS Decatur (DD 936) and served subsequently as Operations Officer and Executive Officer. A tour on board USS Bigelow (DD942) as Executive Officer preceded Commander Felt's assignment to the Naval War College as a student and then a faculty member in 1963. During his tours aboard these ships he made a total of four Sixth Fleet deployments and participated in the Cuban Quarantine of 1962 as well as several NATO exercises in the North Atlantic and one CENTO exercise in the Indian Ocean. From 1966-1968 Commander Felt served as Commanding Officer USS Mills (DER-383) making two operation Deep Freeze deployments to the Antarctic including two round the world cruises en route to and from. He served a tour of duty from 1968 to 1971 as Navy Action Officer for Surface Combatant Forces in the Strategic Plans and Policy Division of OPNAV, working with Navy, JCS and National Security Council policy papers. 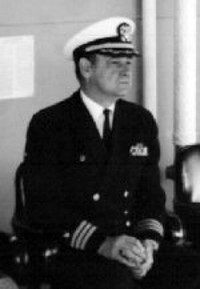 He reported to USS Richard B. Anderson (DD-786) as Commanding Officer in 1971. Commander Felt is authorized to wear the Meritorious Unit Commendation from his service aboard the USS Richard B. Anderson as well as the Combat Action Ribbon. Other personal awards include the Bronze Star with Combat "V" with gold star in lieu of second award, the Meritorious Service Medal, the Navy Commendation Medal with Combat "V" and the Vietnamese Cross of Gallantry with Gold Star. Commander Felt has six other campaign, service and foreign decorations.